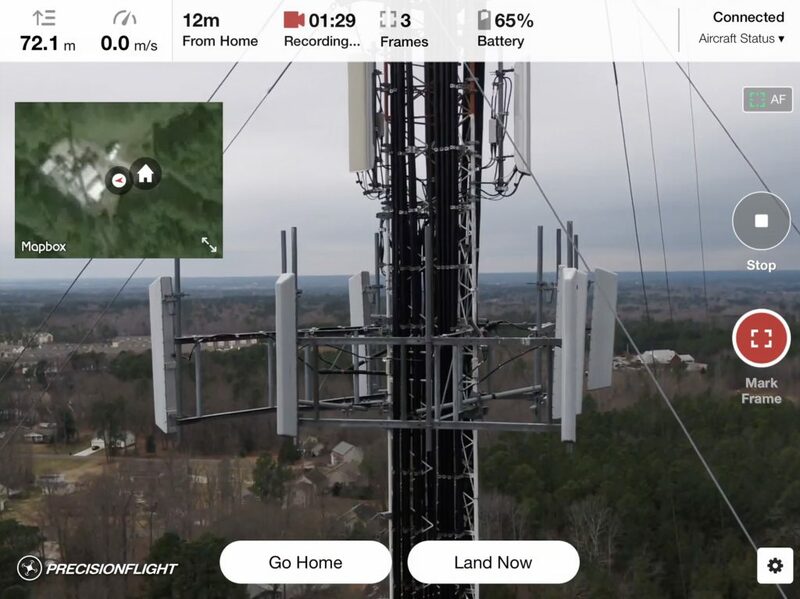 PrecisionFlight, our autonomous flight solution, now provides commercial drone operators additional functionality to capture video data and mark specific frames to call attention to points of interest observed during a flight mission. This new technology enables DJI drone pilots or other on-the-ground observers to integrate video marking and tagging into their commercial remote sensing applications. And it’s all controlled in PrecisionFlight’s simple and intuitive user interface. For example, a pilot inspecting cell phone towers could mark the frame where they observed a damaged antenna array. With PrecisionFlight’s new video feature, operators can see a real-time feed and mark specific frames as they see the video on their device. Experts and collaborators no longer need to review a separate frame list or be located at the survey site to review footage. As a result, PrecisionFlight helps businesses achieve faster drone-based inspection and cost savings. Imagine a construction company working to develop a large tract of land that needs to document the site or show a team back at headquarters a potential problem. PrecisionFlight now provides video capture with frame marking for later review and analysis. The application seamlessly integrates with PrecisionMapper, where drone operators and data teams can analyze video and other sensor data using a variety of specific algorithms. Uploading video and other sensor data from PrecisionFlight to PrecisionMapper is simple. Users can upload their video to PrecisionMapper, which will automatically match the video with their marked frames. They can then review the result at full resolution within their browser and share it with others. Insurance adjusters might use the new video feature when inspecting a house or building. They’ll be able to use the frame tagging feature to mark and log the point in the flight where they notice damage, yielding more robust information available to them upon analysis. This will result in a better claim analysis for their client. Download PrecisionFlight for free—and sign up for PrecisionMapper now.